Hey would you by any chance know the brands roger mayer used for the two transistors. The 2N3904 and 2N3906, were they Siemens, or Panasonic? And if you know the brands of the other parts that would be great. Thanks so much what a great site. Sorry I have no idea whatsoever. I did the layout from a schematic at Fuzz Central, so you may find more information there. Hi Mark, on this particular one, what would you recommend for the 470pF cap, a ceramic one or a silver mica? thanks! Just use what you've got. I have full sets of ceramic, silver mica and ceramic multilayer caps and I'd be happy to use any of them. I do try to avoid standard ceramics much of the time, but I think their usual disadvantages can actually be quite welcome when using them in some fuzz circuits. thanks! on this design, that 470pF capacitor is there for bypassing radio frequencies to ground? It probably isn't going to make a huge amount of difference then. I don't know, it was a question, sorry for that! Could be. It's a filter of some description although if it was specifically for RF I would have thought it would have been at the input with the pulldown resistor rather than after the input capacitor. But it certainly could have been included with that in mind. Any chance of a regular vero layout for this one? Actually, I think there's a flaw in the vero. I put it together and only got a really blatty, very nearly dead 9volt tone out of it until I switched drive 2 lug to drive 3 and placed a wire from drive 2 lug to the spot just below Volume 3. That's when I was able to get a solid tone out of it. I'll post a revamped version in a bit. did you use the latest layout? yeah. That's the one I modified. Initially it didn't work so well. I'll check the board but, it just sounded dead, no offense. I noticed when I tested the connections that when I touched on where I put lug 2 of the drive, the fuzz came on full blast. It was more Muff sounding than I had expected. my build of it sounds great. some people like to use a 25-50K trimmer for the 22K resistor for the collector on Q2 to dial it in even further, but that's the only mod besides an added tone control for it that I've seen. BTW, this one is not supposed to be a muff sounding fuzz. So weird. I'll rebuild as I'm sure I missed something. What are the voltages on the transistors supposed to be? Also, I had to combine, in series, a couple of resistors to get the 680k and the 820k which resulted in the 820k being 810k. I also used a 1kv .001 uf cap for the 1n, without a socket. Question - why the socket for that? Is it to be able to swap out with a different size at will? I like the idea. the socket for the 1n cap is so that as an option, you can just remove it. alot of people prefer it without the 220R/1n in the circuit so if you remove the 1n, the 220R has no effect. I run mine without it. Absolute apologies to you, John. I finally got it to work correctly. I guess I has some bad resistors and caps in there. Question, when I dial down the guitar volume, is it supposed to sound like an overdrive (sort of)? yeah, it'll be more like an overdrive with the instrument's volume down but this one is pretty much a fuzz overall. I also found that matching the hfe's on the transistors makes it sound better (since it removes the fizzy decay). my 2N3906 measures 232 and I'm now using a 2N2222A for the 2N3904 which measures 234. Hi I built this one recently from John Kallas' layout above and it sounds great, but does anybody know how to modify the circuit to increase the gain? With my guitar volume down it sounds really good and gnarly and dynamic (great for playing the riff for Hear My Train A Comin) but I just want more gain for the solo. I'd probably just say audition a few transistors and see which ones sound best? They have the most control over the gain of the circuit I think. Hi, one source tell about hfe in axis stock, Q1 118 and Q2 158. It's hard to find 2N3906 and 2N904 in this range so piggyback it!! much more manageable and usable in all the fuzz pot range without excess or bad decay! Use the tone pot on your guitar to control the high end like the volume for the fuzz, dark fuzz and perfect bright clean accessible to a single hand! This awesome circuit. I look forward to assemble this. However, someone may suggest how add a tone knob to the schematic please? hi greg. i'm under the assumption that this is your first build. before you do anything read the build guide, seen at the top, before building anything. it will explain how to build an effect. not to answer your question about the switch wiring. if you look at the top there is a tab labeled, offboard. this will show you how to wire nearly all effects. 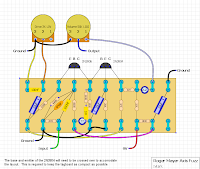 since it's the same in 95% of all pedals you won't see the switch wiring for any layouts, because it's redundant and a waste of time to put in every layout. Indeed, this is often the same wiring, i found it after posting !! I would like to share my mod for tone... How can I send it? I recommend replacing the 47k res with a b50k pot (as variable resistor). I tried this mod (although I swapped different resistors instead of using a trim pot) and found that values lower than 47k make the pedal sound more gated, like it's biased low and values near 60k make it sound more woofy. I settled at a 50k resistor which makes the Axis sound much more like the album version of Spanish Castle Magic and also like the various live recordings from around 1968. Who knows, but perhaps when Roger built Jimi's original pedal he was using those +/-10% resistors they used in those days and his 47k was in reality a 50k. Anyway, this is the third Axis I've built (I scrapped the last two), and along with this mod I also changed the 22k resistor to a 15K, which seems to give me more gain, which I asked about in my previous comment, and also improves the touch-response. I definitely recommend auditioning the transistors... I tried a few different 2N3906's and although the differences are't massive, it's worth spending half an hour or so selecting the best ones. This pedal is definitely a keeper now!